We started picking our reds yesterday. We’ve been really lucky with the weather – the whites were harvested during a lovely second week of September, with dry, chilly mornings and sunny, warm days. It then rained on and off for a week, and our enthusiasm might have been seriously dampened if it had carried on like that. The sun came back though on the 20th, and the last week has been glorious. The first parcel was a block of Merlot on gravel and clay soils. We machine harvested early and hand picked later to test the difference. 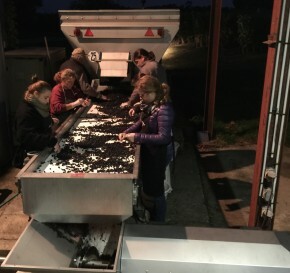 Harvesting by machine before the light comes up allows us to give the juice and the grapes a ‘cold soak’ for several days before fermentation, without having to chill the grapes down by other means, for slightly better extraction of colour and flavour. Good to see the red grapes being harvested in fine weather. Yes, we know it rained on and off for a week, not to mention the wind – we were staying in the farmhouse from 11 to 18 September! Never mind we still had a great time as always. Thanks to Gavin and Angela for all their help and of course to Margaux for keeping us company. We look forward to tasting the produce eventually. Gavin – Those merlot look in cracking condition and Sauvignon hopefully the same. Best wishes for a successful vintage; all looking very good.